Home » Loveable or Lovable – Which Spelling is Correct? As languages change, they often tend more toward simplicity than increasing complexity, especially regarding spelling. As time goes on, more and more words that end in E are dropping the letter before taking a suffix. Such is the case with love when it becomes lovable. However, not all words follow the rule: date becomes dateable, for instance, and marriage becomes marriageable. Why should love be any different? Indeed, most word processors do not flag loveable as a mistake, and if you do a great amount of reading you are likely to stumble across the word at some point. Are both of these words acceptable? 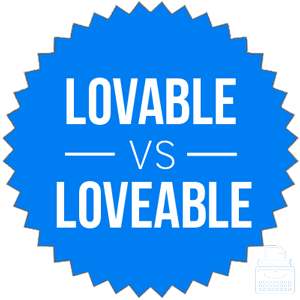 Continue reading to learn more about lovable vs. loveable. What is the Difference Between Loveable and Lovable? In this post, I will compare loveable vs. lovable. I will outline the more common spelling and advise you moving forward in your writing. Then, I will use a mnemonic device to demonstrate how to remember which version is correct, loveable or lovable? This way, you will always know what to use for your own writing. What does lovable mean? Lovable is an adjective that means having the capacity to inspire affection and endearment in others. To put it more simply, something that is lovable is able to be loved. A puppy might be lovable, for instance, or possibly a child. Often, a bumbling, overweight stock character on a TV show is considered a lovable buffoon. Kenzie brought home a box of lovable kittens from the vet and gave one to each of her sisters as Christmas gifts. Brett is a lovable boy as long as you don’t try to tell him that dragons are more dangerous than space robots, because he will try to start an argument about it. What does loveable mean? Loveable is a variant spelling of the same adjective. It means the same thing and can be used in all the same contexts. It has been used throughout history with varying degrees of regularity, but today, it has taken a backseat to lovable as the standard spelling in both American and British English. While this chart isn’t exhaustive in its literary scope, since it only looks at books published in English since 1800, it still illustrates a clear trend that has persisted for over a century. You should always use lovable in your own writing. Loveable isn’t technically wrong, but it has not been the standard form in any language community for over one hundred years. You could use loveable if you are quoting an old source, but otherwise, avoid it. Since lovable and huggable each contain only one E, remembering to use lovable instead of the inferior and unloved loveable is an easy concept to memorize. Is it lovable or loveable? Loveable and lovable are alternate spellings of an adjective that means able to be loved. Both spellings are correct, but lovable has been the standard form since the 19th century. Avoid loveable in most contexts. 1 What is the Difference Between Loveable and Lovable? Lended or Lent – Which is Correct?